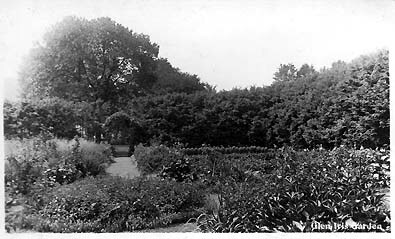 This postcard not only gives us a glimpse of Mr. Letchworth's garden, but also hints of the many changes on the Estate in the months following Mr. Letchworth's death. The card is from "Harry" to Mrs. Charles Isaman of nearby Dalton NY. He writes "you have seen this garden the last time like this. (T)he hedge is most all cut down. The(re) is a great change here a new foreman and the girls is all going away. I will write more soon. Harry." The garden was located were the Museum now stands. They can be seen on the 1902 Glen Iris Estate map. On the map the garden is marked with an oval and is located just above and to the left (southwest) of the Glen Iris.